Imagine your business has been mostly developing me-too and incremental new products. Your products start looking a lot like competitors’—a fact that does not go unnoticed by your customers’ purchasing agents. Since they can interchange your products with competitors’ products, they’re able to pressure you for lower prices. As a result, your profits have been declining and now it’s time to prepare next year’s budget. Do you cheerfully tell your boss to expect more profit declines? I’m guessing… no. To salvage next year, you’ve got to reduce costs. But you won’t cut spending in short-term areas needed to meet next year’s budget. You’ll probably cut longer-term costs, like R&D or marketing. Of course, this means you’ll have less new product development capability… especially for high-impact new products. So when budget time rolls around a year later, you have even fewer options. This is called the death spiral for obvious reasons. Sometimes a business survives, but just on “life support”—where it is no longer relevant. Forces pulling a supplier toward “specialty” come from the supplier… or they don’t come at all. Change your time horizon. In a 1972 Harvard Business Review article, Richard Vancil complained that long-term product development expenses are buried within short-term operating plans… allowing short-sighted business leaders to “raid” funds needed for their future. Does this problem still exist? Consider putting all your budget dollars in either a short-term bucket or a long-term bucket. @aim_institute. And make sure someone is watching the long-term bucket. Work on high-impact products. Some companies play it safe and work on only “low-risk” me-too and incremental new products. 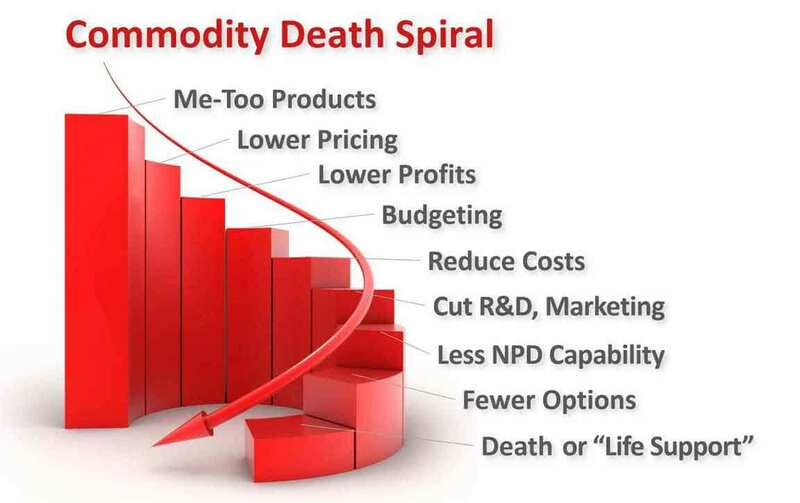 But, as shown in the commodity death spiral above, this is the beginning of the end. While each me-too and incremental project may have low risks, a business built only on “low-risk” projects is actually at great risk. So make sure your new product project portfolio has a healthy proportion of high impact new products… products that will deliver significant value to your customers. Get out more. While it’s risky to incrementalize, it’s also dangerous to invest in “great hope” projects: high-stakes gambles with lower odds than management realizes. These pull in lots of manpower, funding, and management attention, and after two or three years often end with a whimper… typically from a fatal flaw that should have been discovered much earlier. So if there’s too much risk with both me-too and great hope projects, what’s the answer? I believe we need to “get out more.” Spend much more time in your customers’ world to reduce your commercial risk. @aim_institute And reduce your technical risk through open innovation… uncovering and introducing technologies from outside your company. Level 1: Our Conference Room: Deciding what customers want around your conference room table. Level 2: Ask Our Experts: Polling your sales force, tech service & others to determine customer needs. Level 6: B2B VOC Interviews: B2B-optimized methods to fully engage knowledgeable B2B customers. Here at AIM, we’ve developed the world’s most advanced methods, tools, and software for Level 6 B2B-optimized interviews. To learn more, see 10 Blueprinting Differences from Traditional VOC or check out video samples of our training at theaiminstitute.com/training/single-team-e-learning/.